For High Amperage applications, CDR Technical Services Limited now offer and extensive range of versatile Robertshaw Hi-Limit Thermostats for heating and commercial catering applications. 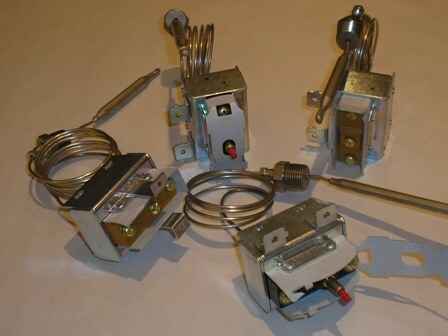 This range of Hi-Limit Thermostats are unique in design as they are able to operate on a 30amp supplu. Temperature settings between 150F to 600F. The Robertshaw Hi-Limit Thermostats range can be supplied with manual reset function or auto-reset. Please not these devices are Non-adjustable. Hi-Limit Thermostats are designed to operate as a policing device and only operate if the control device fails. The Hi-Limit Thermostat range is approved to CE, UL and CSA certification. 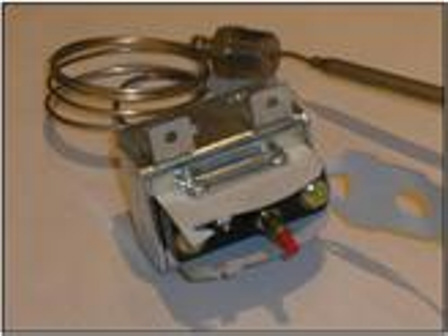 R-LCCH Hi-Limit Thermostat: The R-LCCH Hi-Limit Thermostats break the electric supply once the set temperature is reached during operation. This device is noticeable by the inclusion of a Manual reset button. The R-LCCH range can be reset after the appliance operating temperature has reduced by 50F. The device incorporates a fail safe feature, which means any damage to the capillary will result in the thermostat not resetting. The device is commonly used in applications were there is a need to switch up to 30amps at 240volts. Applications commonly using this device are Heavy duty fryer ranges and Industrial Heating applications. Millivolt operation is also availble with this device. R-LCCM/R-LCHM Hi-Limit Thermostats: This range of Hi-Limit Thermostats are designed with a similar construction to the R-LCCHrange, but dom not have the distrinctive Manual reset button and automatically reset when the operating temperature is reached. Applications include Medium duty Gas Fryers, operating on Millivolt supply.